Welcome to Manston Mobility online, a small company with customer service at the heart of our ethos. We believe that mobility should be affordable to everybody, and customer service is paramount to our business. Our customers can be found all around the south east kent, because we can come to you if you can't get to us. We have a 1900 sq foot showroom near the Hornby factory in Thanet Margate, about half a mile from the QEQM hospital and we have lots of free parking as well as a disabled parking bay. 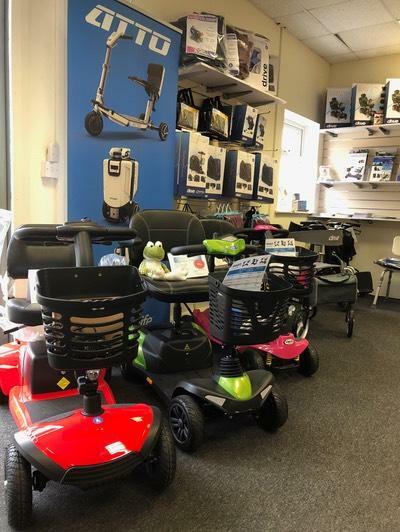 We keep a wide range of products on site and its a safe area to test and try various mobility scooters. New and Used Mobility Scooters, Folding Scooters, Wheelchairs and More..
Road Scooters ,Pavement Scooters,Folding Mobility Scooters, Pre-owned Mobility Scooters, Rise & Recliners , Powerchairs , Wheelchairs. Canterbury (Harbledown, Rough Common, Sturry, Fordwich, Blean, Tyler Hill, Broad Oak, Westbere, Wingham, Littlebourne)Birchington (Birchington-on-Sea, St Nicholas-at-Wade, Sarre, Acol), Broadstairs (St.Peters), Deal (Deal, Walmer, Kingsdown, Ringwould, Sholden, Great Mongeham, Worth, Ripple), Herne Bay(Herne Bay, Herne, Broomfield, Greenhill, Eddington, Beltinge, Reculver),Margate (Margate, Cliftonville, Birchington), Ramsgate (Northwood, Minster-in-Thanet, Cliffsend, Monkton, Manston), Sandwich (Sandwich, Eastry, Woodnesborough, Great Stonar, Richborough), Westgate-on-Sea, Westwood and Whitstable (Whitstable, Seasalter, Tankerton, Chestfield, Swalecliffe, Yorkletts). Should we be unable to repair your scooter or powerchair on site, or on time, a loan unit can be made available should the repair take longer than 24 hours. Loan units are subject to availability. There is too much to squeeze onto this website so why not give us a call ? We have carefully chosen some of the best brands and companies to partner with, offering you a wide choice of quality products from the following companies and brands. Acorn stairlifts, Movinglife ATTO, Celebrity Furniture, Patterson Medical, Drive Medical, Invacare, Komfi Rider, Freerider, Shoprider, Monarch, Invacare, MovingLife, Able2, Van Os, Z-tec, Roma Medical, TGA, Sunrise Medical and Uniscan from which we’re able to source a wide range of products and accessories, such as: mobility scooters, orthopaedic products, wheelchairs, electric wheelchairs and powerchairs, rise and recline armchairs (Riser Recliners), walkers and rollators, walking aids, pressure cushions, bariatric wheelchairs and pressure cushions. Qualifying goods can be purchased from this store without VAT, but you need to be eligible. Most people with a long term illness, disability or terminal illnesss qualify for VAT free purchases. At the checkout, you just need to select VAT relief and complete the details about your condition. Areas that we service include. Scooters, Disability Scooters, Wheelchairs, Powerchairs, Riser Recliners, Rise and Recline.